Published by Daniel Lewis on August 2, 2014 at Bleacher Report. Click to read article on Bleacher Report. Though the claim was bold, McCoy did lead the NFL in rushing and yards from scrimmage last season. He thrived in coach Chip Kelly’s offense, weaving through defenses to the tune of 1,607 yards and nine touchdowns in addition to 540 receiving yards and another two scores. Can the 26-year-old put on a similar show this season? There is no reason not to expect an encore. Even the best running backs require solid blocking to find running lanes, and no running back received better run blocking last year than McCoy. According to Pro Football Focus, the Eagles ranked as the No. 1 run-blocking offensive line last season. In fact, they led the league in good blocking rate (GBR), preventing opposing defenses from disrupting a running play on 49.6 percent of snaps. Second-year right tackle Lane Johnson faces a four-game suspension to start the year, which would only be troubling if the team were not returning its other four starters: Pro Bowl left tackle Jason Peters, left guard Evan Mathis, center Jason Kelce and right guard Todd Herremans. This continuity up front should set the stage for another successful season for McCoy while also allowing coach Chip Kelly to continue tweaking the offense. Some fans might feel McCoy’s performance could suffer in 2014 following the release of Pro Bowl receiver DeSean Jackson, who many feel opened up running space for McCoy by attracting multiple defenders to contain the speedy receiver. However, Kelly remains confident the offense will continue to run smoothly even with Jackson now playing for NFC East rival Washington Redskins. Even if Jackson did garner extra attention last season, the Eagles feature enough playmakers on offense—running back Darren Sproles, receiver Jeremy Maclin and tight end Zach Ertz, for example—to keep defenders honest as they attempt to slow down McCoy. Besides, Jackson was underwhelming at best as a run-blocker and displayed a noticeable lack of effort on plays not designed for him to catch the ball. In an attempt to replace his production, the Eagles drafted Vanderbilt’s Jordan Matthews and Oregon’s Josh Huff, two exciting prospects who represent immediate upgrades as run-blockers at receiver over Jackson and should earn ample playing time in his absence. Last season, McCoy averaged 5.1 yards per carry, a number which could increase even further this season due to the acquisition of Sproles from the New Orleans Saints and an increased role coming for third-year player Chris Polk. 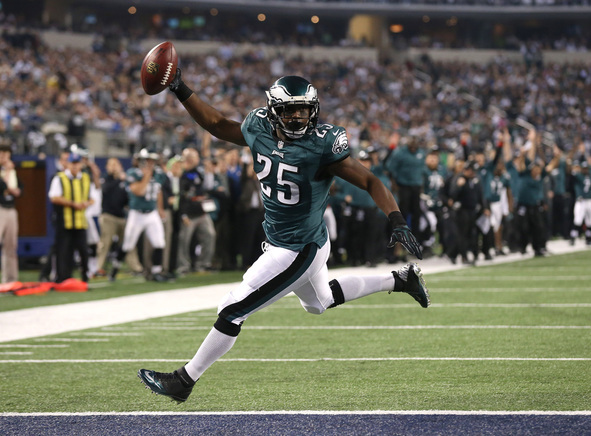 Both Sproles and Polk figure to chew into McCoy’s workload. McCoy will still remain a cornerstone of the Eagles offense, but after he earned 314 carries in 2013, Kelly and offensive coordinator Pat Shurmur hope to have him shoulder a lighter load this season. McCoy is also primed for another big year because he enters this season an even smarter, faster player. After all, Kelly demands perfection and expects meticulous preparation and execution. McCoy expects to be a better player this season after limiting the junk food in his diet, especially late-night snacking on Doritos. Because of the demands of Kelly’s fast-paced offense, McCoy used a stricter diet to trim five pounds off his 215-pound frame from last season.